For what it’s worth, I just want to highlight this exchange from the debate last night. It’s already gotten a fair amount of attention, but I think it was by far the most important exchange of the night. ROMNEY: To go to the University of Texas, if you’re an illegal alien, you get an in-state tuition discount. You know how much that is? That’s $22,000 a year. Four years of college, almost $100,000 discount if you are an illegal alien go to the University of Texas. If you are a United States citizen from any one of the other 49 states, you have to pay $100,000 more. That doesn’t make sense to me. That kind of magnet draws people into this country to get that education, to get the $100,000 break. It makes no sense. PERRY: For a decade, I’ve been the governor of a state with a 1,200-mile border with Mexico. We put $400 million of our taxpayer money into securing that border. We’ve got our Texas Ranger recon teams there now….But if you say that we should not educate children who have come into our state for no other reason than they’ve been brought there by no fault of their own, I don’t think you have a heart. We need to be educating these children, because they will become a drag on our society. This really seems like a killer exchange to me. This idea that Perry wants to give a $100,000 subsidy to illegal immigrants is just electoral gold among the Republican primary crowd. And Perry is stuck: not only did he support this, but he’s dug himself into a big hole by defending it so uncompromisingly. There’s just no way he can back away from it now, and if Romney is smart — and he is — he is going to pound on this over and over and over. Also note Perry’s unusual tin ear here. If you don’t see things his way, he said, “I don’t think you have a heart.” This kind of bluster goes over great when it’s aimed at Obama-loving liberals, but it’s like waving a red flag in front of an angry bull when it’s aimed at fellow conservatives. 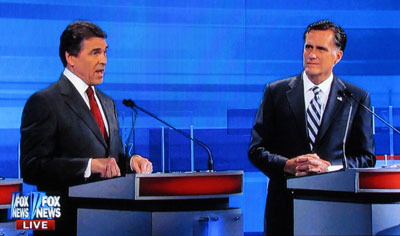 The audience didn’t like it, and I expect Romney to make very good use of this.